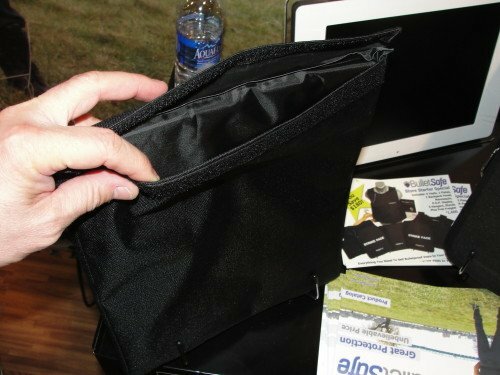 Last year Randall posted an article from the SHOT Show floor on the new bargain priced Bullet Safe Level IIIA ballistic vest (https://www.bluesheepdog.com/2014/01/29/bulletsafe-ballistic-vests/). In review, the premise is police officers, security officers, EMT’s, or other First Responders that do not have ballistic vests provided to them by their departments. 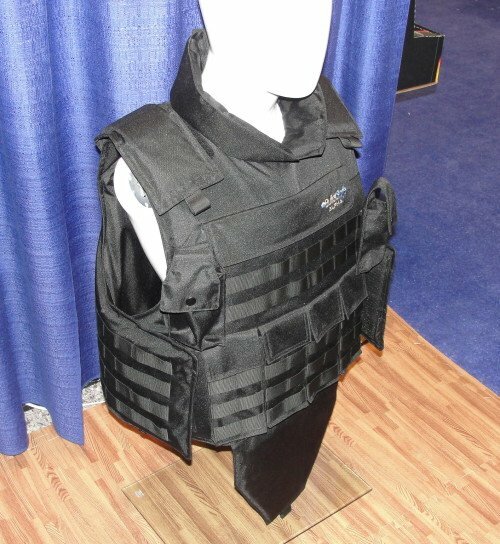 For that reason I think the Bullet Safe ballistic vest option is great for those professionals not issued a ballistic vest (more on that later). The Bullet Safe Semi-Concealable vests are available in (5) sizes – S, M, L, XL, 2XL. There is a 4XL as well, but costs a little bit more for the added material. I got to talk with President, Tom Nardone on the SHOT Show floor about additional Bullet Safe options. The standard Bullet Safe vest. Similar to a TAC vest but still concealable. In addition to personnel not issued critical protective equipment, here’s another concept to ponder – do you have ballistic protection at home? Some officers take all there gear home with them everyday, but there are many (myself included) that store their police gear in a locker at the station. The idea of spending $600-$900 on a home ballistic vest does not go over well with most budgets, but a $300 home security purchase is definitely a plausible consideration. The basic Semi-Concealable Bullet Safe vest is rated to Level IIIA protection, and only costs $299.00! That’s protection from handgun rounds up to .44 Magnum, and provides the highest level of NIJ-rated (0101.04–Ballistic Resistance of Body Armor for Level IIIA) protection for a concealable ballistic vest. In addition to the standard Bullet Safe “Semi-Concealment” vest, there are several other affordable options for specialized units. These are again, very affordable alternatives specifically targeted to those officers in specialized units who have limited resources for critical protective equipment. 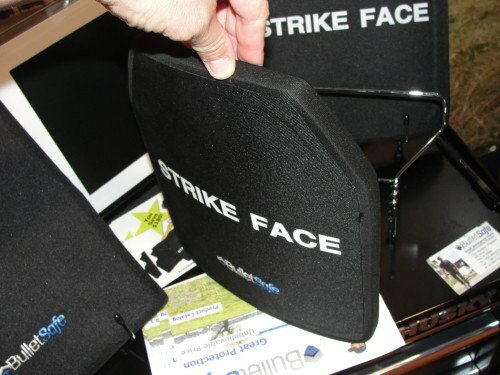 The Bullet Safe ballistic plates, when used in conjunction with the Standard Ballistic Carrier, provide Level IV protection. That is the highest level of protection currently available and will stop some .30-06 armor-piercing rounds. They are made of ceramic, and have the “shooter’s cut”. The ballistic plates are narrow and lighter than many commercial alternatives. These prices are significantly lower than traditional alternatives in ceramic or polyethylene. The ceramic plate is also about 3-5 lbs. lighter than many available alternatives. The ability to have rifle-grade protection for such a low price cannot be lightly dismissed. The Ultra-Light plate is a serious contender on my “must have” list for upgraded protection. 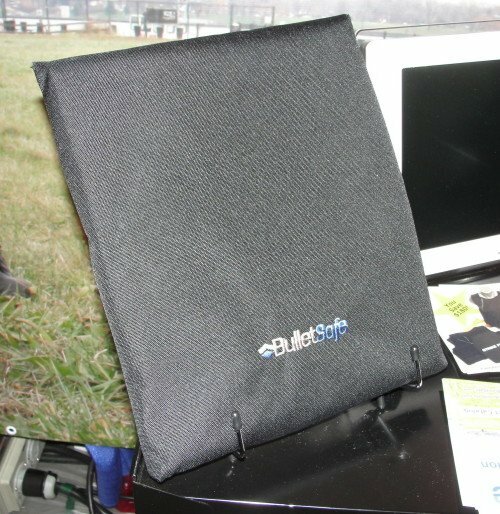 Recognizing that schools are unfortunately a major target for active shooters, Bullet Safe has created a Level IIIA ballistic panel to place inside a toddler’s backpack. Being lightweight and slim. the Backpack Panel will not take up too much space or unduly weight down a child. In addition, these panels can provide outstanding protection for adults during everyday or vacation opportunities. Ask any K-9 officer and they’ll tell you that their dog is a full-time partner (and family member). Police K-9’s represent a significant investment for the department, and a personal investment of the handler. 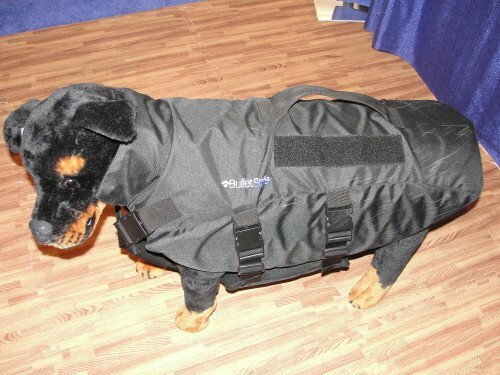 The Bullet Safe K-9 Vest provides outstanding ballistic protection for our K-9 partners, at an inexpensive cost. The Bullet Safe K-9 Option. There are thousands of tactical officers across the country that are forced to improvise with ballistic protection. Whether using second-hand tactical vests, or simply using patrol vests with a carrier, these officers are not as protected as they should be. In addition, how many Task Force officers are performing warrant services where a heavy tactical vest would be more appropriate? Our department just replaced outdated ProTech heavy ballistic vests for our SWAT Team, and the cost was around $1500 for each vest with (6) included pouches. Those “heavy” vests are also Level IIIA vests (unless the ceramic plates are added). Having the ability to have extra protection in critical areas, for a price hundreds of dollars less than competitors, is a great option for financially strapped officers. 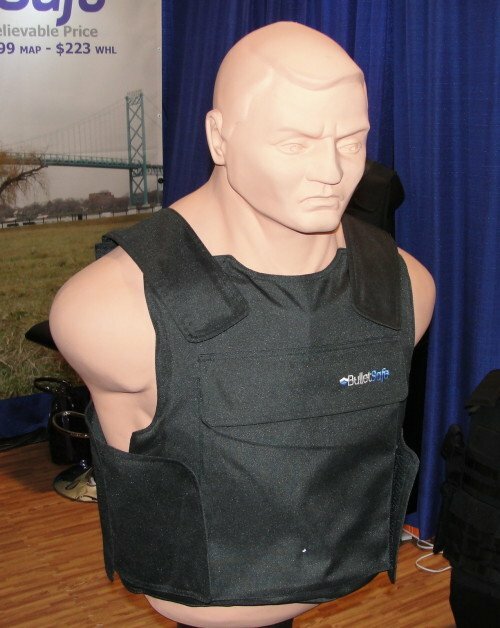 The Bullet Safe Tac Vest offers several features that should benefit responders who are not provided equipment. 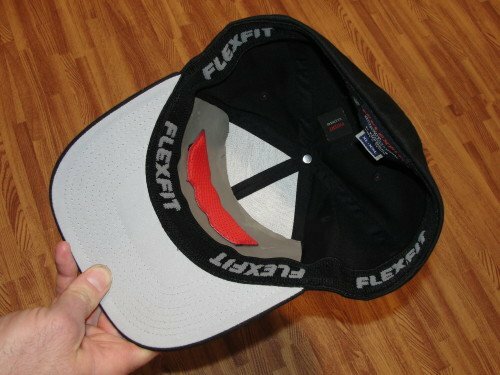 The Ballistic Ball Cap is still in the prototype phase, but the concept is to provide ballistic protection to the forehead in the ball cap. The Bullet Safe Ballistic Ball Cap offers Level IIA protection from the front. The ballistic panel is on the forehead of the ball cap. O.K. – at the beginning of the article I put a side-note in the text saying “more on that later”. 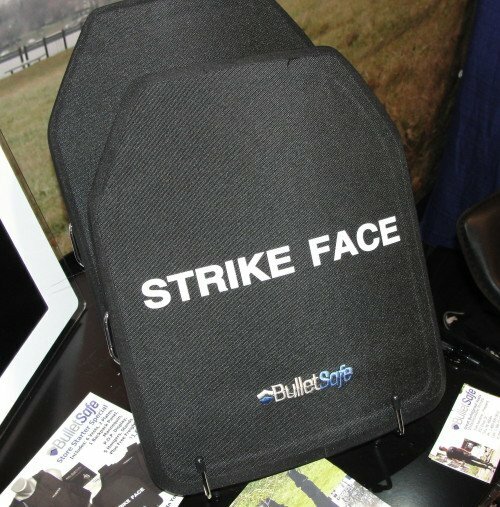 One of the biggest complaints about Bullet Safe products is that the vests and ballistic panels are made in China. I recognize that this is a new company, and the vests are “untested” as far as saves, but I seriously recommend that SheepDogs evaluate the Bullet Safe ballistic option for potential life-saving protection at an incredibly affordable price. These vests are way too heavy…and not concealable. Thanks for replying. These vests are more bulky than some competitors, but I believe they can still be worn under a uniform shirt. Maybe not for civilian use, but for police work yes. The competitors’ vests that are tighter fitting and lighter weight, are also much more expensive. I think the target market for Bullet Safe are officers who do not have an agency providing soft armor to them, and are on a very tight budget. For them, this may be the only real option and I’m at least glad they have something to consider rather than hitting the streets without. I agree Aaron…. Easily concealable under a sweatshirt, just not a golf shirt… Can be worn under a duty uniform without a blink, but would be noticeable with a dress shirt… Sure wish there was a MOLLE version of the carrier (one that’s not $700)…. Any aftermarket carriers compatible?? Good information Jerry, I’ll check on the aftermarket Molle carriers. I got a message back from Bullet Safe. Unfortunately, their ballistic panels are measured and cut to match the Bullet Safe carriers so they do not believe they would fit into an after-market Molle outer carrier. They do have the Alpha vest, which has Molle attachments and pouches, but this may be a little thicker than what you were thinking about.